The under base printing process is neccessary whenever a custom t shirt is being printed using light colored inks and dark colored shirts. If you have ordered custom tees before and your image looks dull and feels rough to the touch, chances are whoever did the printing did not use an under base when the design called for it. 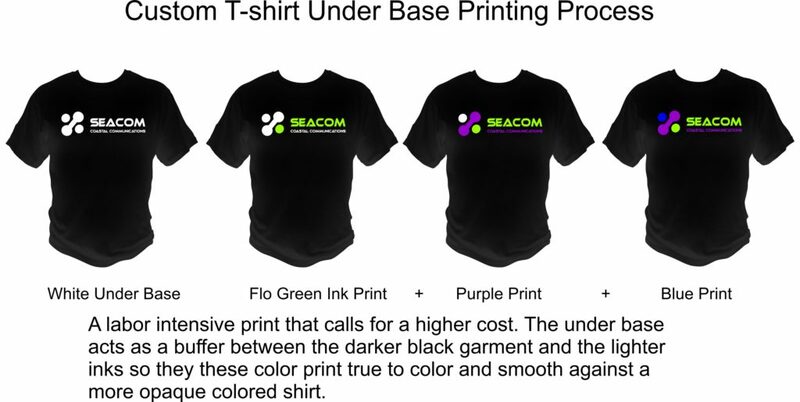 Think of the under base as a buffer between the dark shirt and the lighter colored inks. It acts to prevent the darker garment color from bleeding into the light ink colors and allows the light ink colors to print smooth and stay true to color. If you take black paint and mix it with red paint you get a really dark red or brown color. If you don’t use an under base when printing say red ink on a black shirt the same thing happens, sort of, just not the extreme of the result when you mix paint. But that nice vibrant red if printed straight on a black t-shirt will turn a few shades darker and the texture will be rougher than it should be. Now that you know why an under base is needed here is why you pay more. To print the white under base it requires two separate hits of white and in between is what is call a flash cure. Then the first color is added, using the picture above, that would be green. Then the shirt needs to be flash cured again, then the 2nd color is added, another flash cure and in a 3 color design, the last color is printed and then the shirt is placed through the the dryer to fully cure as every shirt is. So it’s a labor intensive process that is neccessary to provide the best screen print but it also adds a little bit to the price. Can you avoid an under base? One way to keep the cost down is if you design already has white in the graphic. Having a graphic that has white as part of the design means an under base is still used but it makes a 3 color design a 3 color design rather than a 4 color design when white is not part of the graphics color. The other instance would be to go with a lighter shirt. Companies will do that all the time if there is a light shirt color that is part of their company color. At Kirkwood Trading Company we discuss your graphic and options with you so there is never a mystery. We explain everyting in detail so that you understand what we do and where the costs are going. Our goal is to simplify the ordering process that making sure we explain any artwork nuances goes along those lines.